The small, nondescript Pied-billed Grebe has an astonishing talent. The grebe is the master of its own buoyancy. It can squeeze out both the air trapped in its feathers and in its internal air-sacs and sink effortlessly. 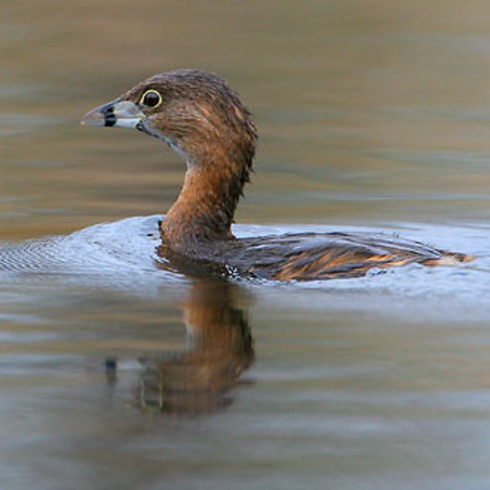 Learn more about the amazing, sinking Pied-billed Grebe at Cornell's AllAboutBirds. Watch this grebe sink... GOING... going... Go to the photos and video below! Support for BirdNote comes from Song Bird Coffee, offering bird-friendly organic shade-grown coffee for over 20 years. More at birdnote.org/songbird. Does this song evoke an old jungle movie? Picture a Pied-billed Grebe, dressed in brown, about a foot long, floating like a cork among lily pads. Suddenly the grebe begins to sink, inch by inch, like a submarine – until it disappears! Thirty seconds later, it reappears, just its head above the water, peering left and right. How about taking the plunge with BirdNote -- helping to keep the shows coming your way. We’re supported entirely by listeners. Learn more at BirdNote.org. I’m Michael Stein. Call of the Pied-bill Grebe provided by The Macaulay Library of Natural Sounds at the Cornell Lab of Ornithology, Ithaca, New York. Recorded by G.A. Keller. Ambient from G. F. Budney.